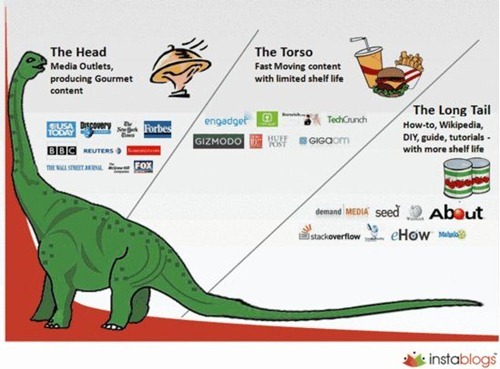 1 What is long tail? 2 Why is long tail important to content business? 3 Why you are not making money from the long tail? 4 What is the real secret in making money in the long tail? 5 How to play for the long tail? 6 Who is making money in long tail? According to Wikipedia – The Long Tail or long tail is a retailing concept describing the niche strategy of selling a large number of unique items in relatively small quantities – usually in addition to selling fewer popular items in large quantities. The concept was popularized by Chris Anderson in an October 2004 Wired magazine article. The distribution and inventory costs of businesses successfully applying this strategy allow them to realize significant profit out of selling small volumes of hard-to-find items to many customers instead of only selling large volumes of a reduced number of popular items. The total sales of this large number of “non-hit items” is called the Long Tail. Create more evergreen content. Enrich your content with more research, comparisons, fact boxes, media, info-graphics; hence increasing its shelf life. Produce content which has an advertiser, reader and virality. The means if you are writing on your spiritual beliefs, your pay checks will always be small – because you don’t have an advertiser in that niche. And if you are writing content by stuffing keywords researched from Google Adwords, you will never have a reader for it. Thirdly if you are only pushing content for the sake of pushing more and more content but don’t have an expertise or interest in that subject you will never be able to promote it across social media or search. Produce content at a large scale in a very efficient manner keeping focus on high quality. Volume required is so high that it is not possible for fragmented bloggers or writers to take advantage of long tail. Now the question arises if not writers and freelancers – they maybe mainstream media houses can do this? After all they have been creating expensive and useful content in volumes for decades now. But the truth is news has a short life; it loses most of its value just after couple of days. Essentially big mainstream organizations are sitting on a huge worthless archive of articles that have become irrelevant, at least until someone finds a new business model for them. Divide the content creation into assembly line mode of operation. Provide a collaborative environment in which the content creation starts from market research; picking topics from commercial long tail and then bringing writers, copy-editors, researchers, multimedia experts together. Just what AOL Seed, and Demand Studios are doing. Produce as much content as you can. Typical an article will take anything from 3 months to 6 months to recover its cost and will make you profit after that for its life. Average life of an article can vary from 24 to 36 months. But a right piece of content can even last for a decade as well. Keep eye on all metrics at all time; cost of article creation, time to create, traffic, social links and amplification, revenue and most importantly margin. Margins can range on long tail content from anything between 40-80% (avg. 3 years). Any small fluctuation in a single metric can entirely change the complete game. Now even Indian Temples getting ISO Certified ! excellent article… Just to add some more titbits….Long tail creates exceptional income generating opportunity for companies which aggregate this inventory since Long tail products/publishers have a very less bargaining power compared to the large established products. Amazon able to do it with physical inventory is a great achievement in itself. And at the same time it is much more easier for companies to aggregate Long tail content in the online world. Nice post and good analysis. It would be interesting to hear any ‘long tail’ kind of light you can throw on the blog network you run and you monetize that.